Paula Burch is a scientist with degrees in biochemistry and biology who became frustrated with the difficulty of finding user-friendly information on the chemistry of dyes and resolved to find and share the information dye artists need to take full advantage of their materials. She established her All About Hand Dyeing website in 1998. Can I expect Retayne to fix the dye in a length of handwoven cloth from Myanmar? I have received a gift of about 7 meters of fabric, apparently hand woven in Myanmar (Burma). It does bleed, a nice turquoise, after testing. It has not yet been washed. I read one of your articles about dyeing jeans, and apparently Retayne does not work on all types of dyes. Have you had any experience with using Retayne on fabrics from the east? India or Myanmar? Can I expect Retayne to work? Is the fabric silk or a synthetic? Of course it seems more likely that handwoven cloth is woven from a natural fiber, but you will need to make sure. If the fabric is silk, then chances are it’s been dyed with an acid dye, or possibly a direct dye. 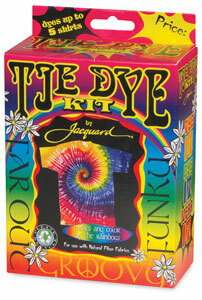 Retayne should work for an acid dye or a direct dye on silk. If the fabric is polyester or acetate, it’s been dyed with a disperse dye, and Retayne will not be able to help. How can you find out the fiber content of an unlabeled fabric? Snip off a small amount of fabric and try a burn test. Two excellent resources for interpreting the results of a fiber burn test are Griffin Dyeworks’ Burn Test page (see their Burn Test PDF) and Ditzy Prints’ Fiber Burn Chart. To test for acetate or triacetate, try dissolving a bit of thread from your fabric in some acetone-containing nail polish remover. 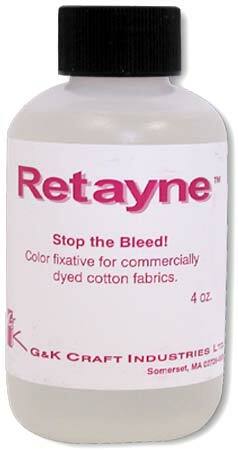 For more information on Retayne, see my page on Commercial Dye Fixatives. This entry was posted in fixing dye on February 28, 2018 by pburch.